This envelope is 5 1/8" x 3 1/2". It's a yellowish, off-white color; it may originally have been white. It has no return address but was mailed to Mr. Jean La Forêt, Vice Consul des Etats Unis, 30 bd Carnot, Alger. 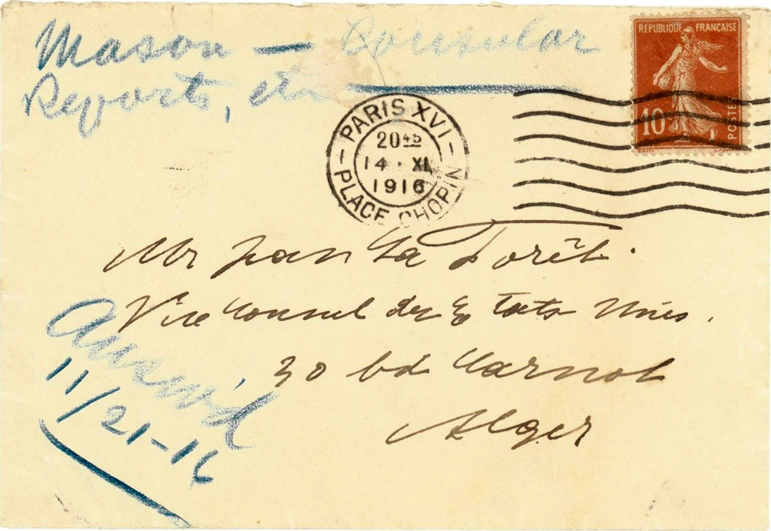 The postmark is from Paris, XVI Arrondissement, Place Chopin, November 14, 1916. The cost to mail it was 10 centimes. In what appears to be Jean's handwriting, it has "Mason — Consular Reports, etc" at the top and "Answ'd 11/21-16" at the lower left. 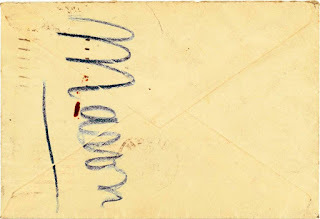 The reverse of the envelope has "Mason" written in large letters sideways. There is the barest hint of the postmark from when it was received in Algeria; "ALGER" can be made out (upside-down from this perspective), but nothing else. 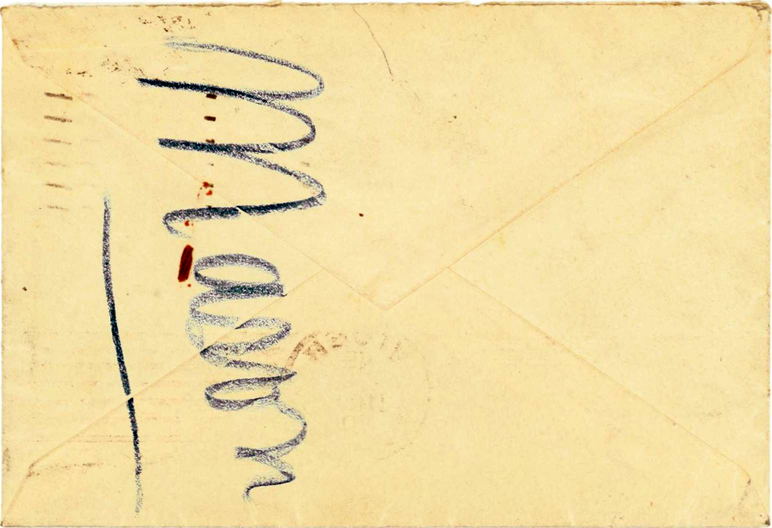 The reddish-brown mark under the letter "a" in "Mason" feels and looks like a dried piece of rubber band that is stuck on the envelope. I'm hesitant to try to pull it off in case it tears the paper. And as with the four envelopes mailed to Jean from the "American Consular Service" earlier in 1916, this one is empty. Looking at the writing on the address here, it is similar to that on the four previous envelopes. Maybe they were sent by the same person. And this envelope has what might be a name: Mason. Is that who mailed it? Sometime between April 27 (the last of the four earlier envelopes) and November 14, Jean moved and/or the sender learned of Jean's new address. And we've seen this address before. 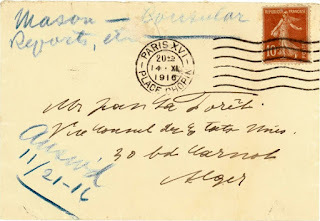 Someone named Mason (I still can't read the first name) sent a postcard to Jean at boulevard Carnot. I'm going to assume this is the same person. So now I have five empty envelopes, from what I have to assume were letters mailed to Jean by Mr. Mason. This time, however, Jean gave a clue as to why he might not have kept the contents. If "Consular Reports, etc" referred to what was sent to him, those might have been filed and kept at the consulate. If the previous envelopes held similar items, they also were probably kept at the consulate. But then I have to wonder why Jean bothered to keep the empty envelopes! I've discovered an interesting conflict about boulevard Carnot. Google Maps told me it is the current avenue Taleb Messaoud, and that's what I posted earlier. But French Wikipedia says it is now boulevard Zighoud Youcef in central Algiers. On further investigation, avenue Taleb Messaoud is in the El Biar suburb of Algiers. I'm leaning toward the location in central Algiers as being where Jean and Emma were living.